the Ag Center, click here! Small plots are used at the learning center for students to identify specific plants. These plots include native grasses and herbs, legumes, cool season grasses, and annual crops. Several tree species have also been identified and planted. The learning center provides many benefits for the Chillicothe and Green Hills' area. 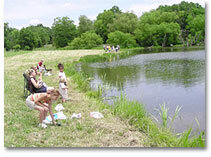 Provides a pond for studying aquatic life, food chains, environmental concerns, etc. A large classroom provides a place for students to gain hands-on experience. They are given a chance to collect samples from around the center and examine them more closely with the tools available in the classroom.